I cannot remember where, but I got involved in a discussion about music, its influence on a person's life, and when that influence began. What's the first song you remember? For me, it was Frankie Laine's "Ghost Riders in the Sky." Why? Where? I don't know, but I can remember it blaring from the kitchen of my grandmother's porch of the little cottage on Lomita Boulevard. 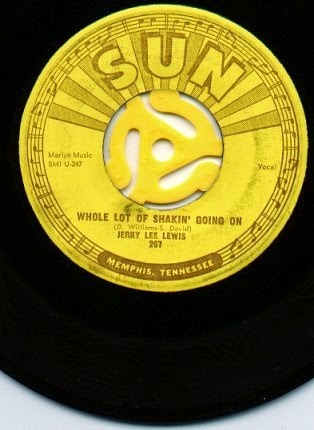 Then, as a teen—isn't always a teen generation that gets entranced my music?—it was first "Unchained Melody," but soon it was Little Richard, Fats Domino, Jerry Lee Lewis, and Elvis. Fairchild Air Force Base, 1956, a radio station playing "Heartbreak Hotel" every 15-minutes is etched into my mind. An aside, made with nothing but artistic criticism, Fats Domino's "Ain't That A Shame" was covered by Pat Boone way back when there was segregation in music as much as at lunch counters. It may be teenagers getting a whiff of the real stuff contributed a bit toward integration, but I won't go so far as to suggest that. All I know is that Boone's version had none of the power of Domino's original. Lately—other than my only classical obsession, Bach—I've been listening to a lot of Americana music, mostly the Texas variety, mostly Robert Earl Keen and Lyle Lovett and their contemporaries from the Austin music scene, liking Keen for his narrative songs and Lovett for his quirky yet intelligent lyrics. Aside number two: there's an excellent Americana singer locally here, Lyal Strickland. What struck me when I begin listening to Americana music was how many of the artists write their own material, which I suppose brings me to the point of this bit of rambling: a search through the morning's news, a stop at NPR, and the Americana, rock-a-billy artist JD McPherson. Good stuff, every minute. This fellow sounds a whole lot like you might think Buddy Holly would were he around today. Holly and the Crickets had the talent of making every instrument distinct in a song, with Holly's inimitable voice weaving in and out as the song progressed. McPherson's work has that same power—deft instrumentation, a distinctive voice never drowned out by the power of the music.